Sweet potatoes are a root vegetable most known for the Thanksgiving side dish—sweet potatoes! But this terrific tuber offers wonderful health benefits that should be incorporated into the diet year-round. It’s an excellent source of vitamin A, a very good source of manganese and vitamin C, and a good source of copper, fiber, potassium, tryptophan, and vitamins B3, B5 and B6. 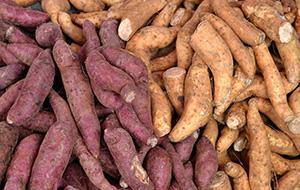 And sweet potatoes are chock-full of beta carotene—a carotenoid with antioxidant properties. By consuming foods rich in beta carotene you can help keep your body healthy and happy. In the body, beta carotene is stored in the liver, and from there the body converts it into vitamin A. And beta carotene may help increase memory and protect your cells from free radical damage. Take note! If you notice that your skin seems yellowish on the palms of your hands and soles of your feet, you may have carotenodermia—excessive consumption of beta carotene. This condition is not associated with any toxic side effects but you may want to reduce your beta carotene intake!